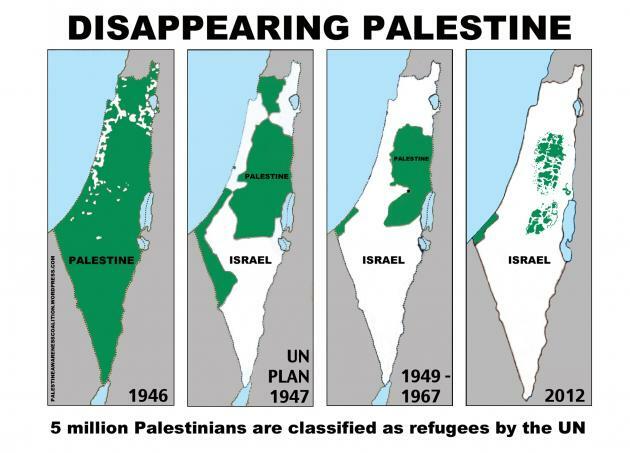 Charlotte Kates, a spokeswoman for seven Vancouver–based groups calling themselves the Palestine Awareness Coalition "said the images, which went up in Vancouver on Tuesday, show the steady occupation of Palestinian territory by Israel. The coalition got the idea for the 'Disappearing Palestine' campaign from similar ads that have run in American cities like New York, Seattle and San Francisco. 'We wanted to draw attention to and shed light on the ongoing human rights violations ... against Palestinians,' she said. Jewish groups have declared strong opposition to the ads, which are displayed at a wall mural in a Vancouver SkyTrain station as well as on 15 buses, and have tried to have TransLink, a government agency, remove them."